When Andrew Avery learned that he had won Dinner With a Pete as an award for his fundraising efforts before the Kawartha Komets' game with the Peterborough Petes last November, there was no question as to which Pete he wanted to dine with. Josh Mcguire and Andrew clicked the first time Andrew and the Komets played a fundraising game with the Petes several years ago. The two are both Cobourg, ON boys and they had a great time enjoying their poutine. 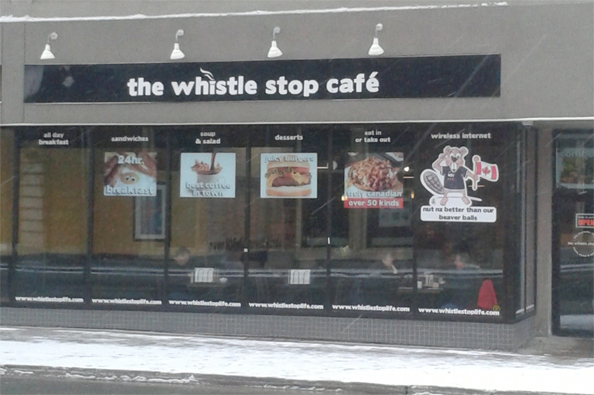 When asked where he wanted to eat (it was his choice) Andrew, without blinking an eye, said the Whistle Stop Cafe at the corner of George and Charlotte Streets in Peterborough, famous for their poutine. Whistle Stop owner and friend of the Komets, Peggy Shaughnessy, was the ideal hostess, generously covering the cost of the meal for Andrew, his father Dave and Josh. Sitting at the other end of the restaurant, Carol and I watched (and listened) as Andrew talked Josh's ear off. Everyone had a great time! Thanks to Peggy for her hospitality, thanks to Josh for his support and encouragement of Andrew and the Komets and thanks to Andrew himself for his fundraising efforts that enabled him and 56 other Komets to participate in the KIP Friendship Tournament in Kitchener earlier in February. Note: Earlier in the season Josh Mcguire presented the Kawartha Komets with a cheque for $750.00. Thanks so much, Josh, for supporting the Komets.